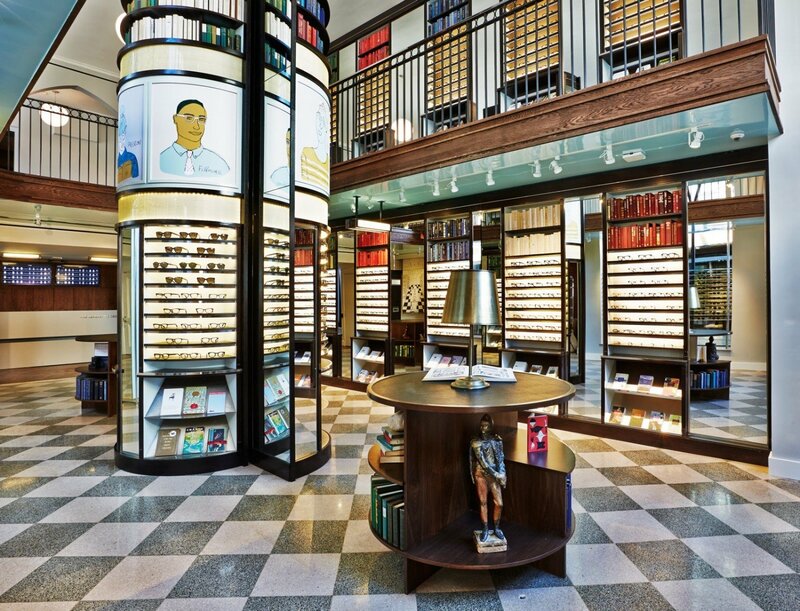 We couldn’t be more thrilled to open the doors to our new store in the Upper East Side tomorrow. Home to many of New York’s best-loved museums, grandest historic landmarks, and, of course, literary characters, this part of town has been a dream of ours to settle in since the start—and now we’re here. Nearly two years after the renowned pharmacy Lascoff Drugs closed its doors, we’ve reopened the celebrated space—enjoy its checkered terrazzo floors, 21-foot cathedral ceilings, gothic windows and two floors (which include a mezzanine). We’ve also installed a pneumatic tube system to transport glasses from one floor to another at top speed (Futuristic!). Hanging above the store will be the decades-old signboard that marks 1209 Lexington Ave. In addition to eye exam rooms, literature-filled reading nooks, and an honor bar, you’ll also find The Reference Desk—a new one-stop-shop for pickups, adjustments, eye exam check-ins and more. Come visit us at 1209 Lexington Ave (corner of Lexington Ave and 82nd Street), or clickity click on over to our retail page for more information on the store and our showrooms. You can book your eye exam online.